Is your company considering creating a web or mobile application? Whether you’re in the beginning or end stage of the mobile development process, with the proper outreach, you’re poised to connect with mobile and smartphone users across the US and internationally. More and more, customers are looking for solutions to daily challenges that your business may be able to fulfill. In this article, we’re going to untangle the debate on native v. web applications and consider how mobile advertising could affect your business. Also, we provide insight into why these two mobile options are essential in connecting with your mobile consumers using recent analyses. There are several major differences between native and web applications. The most significant difference is that web applications are like mobile websites, whereas native applications have to be downloaded on the phone. Downloadable native applications often have a more rich user experience, may be slightly quicker, doesn’t always require cellular coverage, and may offer more multimedia content. Smartphone penetration now represents between 30-50% of mobile users depending on country (currently around 35% in the USA). There are 100MM smartphone users in the United States alone, with around 1.1 billion of the 5 billion mobile phones being smartphones. Of those users, 9 of 10 use their phone on a daily basis. According to TechCrunch, “as mobile phone useage increases and smartphone adoption grows, more and more consumers are using their mobile for functions other than phone calls.” This shows, as application downloads continues to increase, now at around 49% of subscribers downloading applications, and 48.5 using browsers. That’s a lot of opportunity to connect with your target audience where they’re interested in learning more about your product or service! 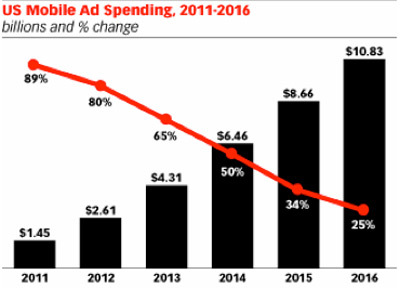 Are other companies investing in mobile? For CIOs, mobile technology and consumerization are an important focus. In a 2012 study by Atenna, 43% of companies are currently working on a mobile app for their customers, 42% for their employees and 32% are currently working on hybrid web-apps for their customers (28% for their employees). However, in that same study, research showed only 45% of businesses have mobile compatible websites for their customers. In another 2012 report on Native v. Web Applications by Global Intelligence, which found that each had their own advantages. Overall, however, as the Nielsen report also shows, publishers see higher user adoption and usage volume on native applications versus web applications. Web apps are more likely to be developed in-house, and take longer to create. 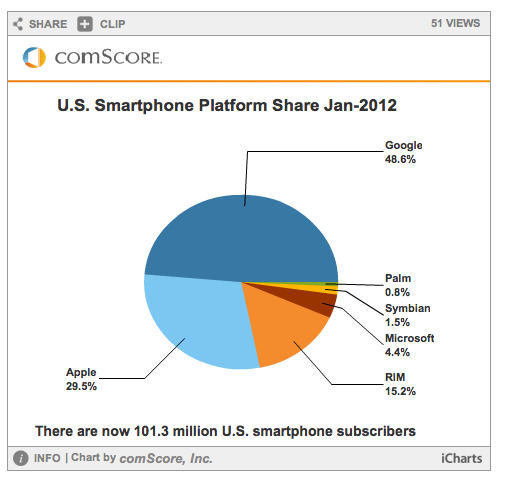 On the other hand, Forrester in 2011 notes that mobile applications—native or web—are not going anywhere. “As mobile useage increases worldwide, both side of the equation will grow with it and become valuable aspects of product roadmaps,” according to ReadWriteWeb. Whether your company is considering a mobile or native application, you’re taking the first step in the important transition to creating mobile opportunities. As a leader in mobile and web application development, we’d be simply tickled to answer any of your questions on developing your own custom application. We want to get to know your needs! To get in touch with us directly, contact our CEO & co-Founder Chris Pautsch at sales@keylimetie.com. Author: Erica Grigg is Director of Marketing at KeyLimeTie. With nearly a decade experience using traditional and digital tools for marketing, Erica is constantly exploring the mobile and social landscape for KeyLimeTie. Prior, Erica came from an agency background where she was Partner and Director of Marketing & Digital for clients like the UN and WWF. Erica has presented extensively on digital marketing, and co-authored a book on Facebook marketing. Follow Erica on Twitter @ericagrigg or on LinkedIn. Erica also tweets for @keylimetie and posts regularly on the KeyLimeTie Facebook Page.